by phone, fax or mail. 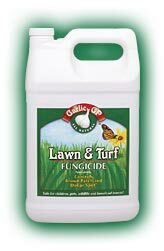 Garlic GP Lawn & Turf* is an all-natural, chemical-free fungicide that controls brown patch and dollar spot. It’s safe for children, pets, birds, wildlife and beneficial insects, as well as yard-friendly creatures such as earthworms. Garlic GP Lawn & Turf - a safe and healthy alternative to chemicals - saves on grass replacement and is very economical, covering up to 10,000 square feet. It works for up to 21 days after application and becomes odorless in hours. Garlic GP products are also available at a growing number of retail outlets in Texas and Colorado. University of Arkansas Division of Agriculture: Effect of a Garlic Extract on Growth of Select Soil-borne Fungal Organisms in Culture. Iowa State University:Evaluation of Fungicides for Control of Brown Patch and Dollar Spot in Creeping Bentgrass. Reports require Adobe Acrobat to view and print. Click here to download Adobe Acrobat Reader.